More than 14 years on line helping folks with their air compressor problems! When a capacitor, or both compressor motor capacitors fail, you will need a new one or two. What capacitor does my compressor need is a question many compressor owners ask on this site, meaning that finding a source for the capacitor of a low-cost air compressor can be a challenge. Here’s how you can figure out what capacitor is required by your air compressor. First… what are compressor capacitors? Without getting into too many details as this information is covered on other capacitor information pages on this site, the compressor capacitor typically sits on the side of the compressor motor. It – or they (some compressors have a start, some have a start and run, and some have a combination start/run capacitor) – are useful in getting your compressor motor to start, and in some cases, keep the compressor motor running. In the image below the red dot identifies the capacitor housing on a typical compressor motor. The capacitor sits inside the housing. Your compressor motor might just have the capacitor itself attached or adjacent to the motor rather than inside a housing as the one in the picture is. So, What Capacitor Does My Compressor Need? To help you better visualize one, here’s a capacitor from a Campbell Hausfeld air compressor motor. In the quest to find a replacement, know that compressor motor capacitors have two ratings. Look on the side of the capacitor. There should be a label. On that label will be the ratings. One of those ratings is voltage. Typically the voltage range will be 120-240 Volts. As long as you get a capacitor that has the same voltage range as the one you currently have, then the voltage will be satisfactory for your air compressor motor. Another rating noted on the label will be the microfarad capacity. It may show as an MFD rating, MFD being the acronym for micro-farad. These are different ways that identify the microfarad rating of that capacitor. 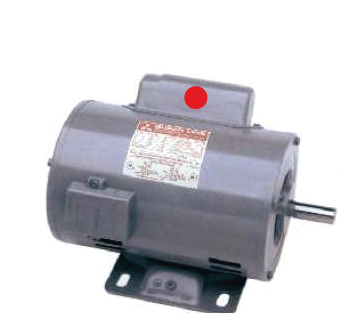 Wondering what capacitor does my compressor motor need? You need to get one that has the same microfarad rating as the existing capacitor, or, one that shows a microfarad range into which the existing capacitor range fits. The last thing you need to figure out is whether or not the new capacitor will fit on your compressor motor. Typically they all have terminals to which you connect the wires to the motor, yet what I’m referring to here is whether the new capacitor will fit inside the existing capacitor housing or not? You see, if the new capacitor has the same voltage range, the same microfarad range, and you can attach it to the existing mounting of the motor capacitor on your compressor, you can use it. 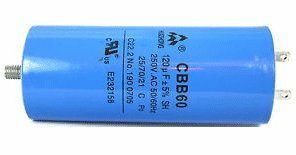 Even if it’s a different shape, a different color, longer or shorter or bigger around, as long as the voltage and microfarad ratings are the same, it is a suitable capacitor for your compressor motor. A simple Google search string such as “buy capacitor for xxxx air compressor” will typically return a number of sources. Pick one that suits according to the details noted above, and you are in business. Search here to find the specific compressor info you need! Troubleshooting a compressor. Issues common to all and by the compressor make. To help you understand compressors!